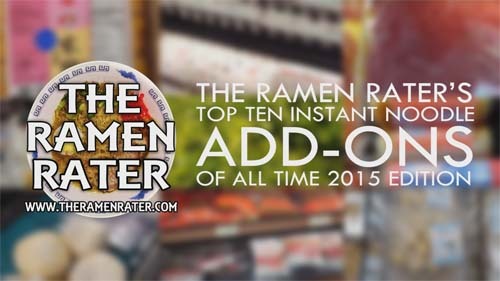 In the last few years, I’ve seen a large amount of articles with titles like ‘Best Ramen Hacks,’ ‘Pimp Your Ramen’ and so on. These titles fall under the category of clickbait – using hipster terminology and such to entice one to click on them. Usually, they’re all things people know about already; vegetables, oils and such. This is a list of my favorite add-ons and garnishes. While some may be familiar to you, others may not be. 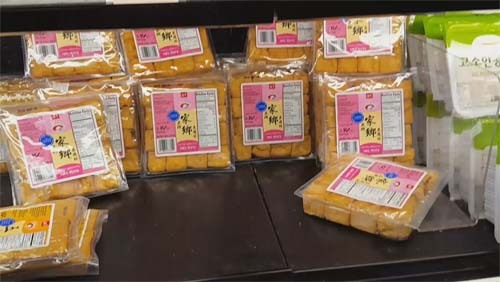 It’s also geared to help you navigate the Asian Grocery, a place many find to be alien to them but I have found to be one of the most vibrant and wonderful places I visit very regularly. Finally, I also included some tips of storage and how long these products last for those on a tight budget. In no particular order, here’s this new list! Often found on end caps, either refrigerated or on the shelf. Chinese sausage pairs quite well with spicy, beef, pork, spicy beef and spicy pork varieties from China and Taiwan. They sausage is wrinkly on the outside kind of like a beef stick and has a sweet taste. I freeze these (they’ll last a long time without freezer burn) and then take out a link and slice in thin pieces. They’re easy to slice when frozen. Toss in at any point while cooking the noodles and they’ll add a little protein and a little oiliness to the broth. These can be found not surprisingly with the myriad of tofu varieties. They’re like little spongy cubes of delight! Just take one out and cut in half (I use kitchen scissors) and drop in your instant noodles. I like them primarily with curries. They often will have 2 weeks on them in the refrigerator – I’ve never frozen them and guess that wouldn’t work very well. Mung bean sprouts should be pretty easy to get anywhere. I prefer a brand called Salad Cosmo; they seem to stay fresh a lot longer. 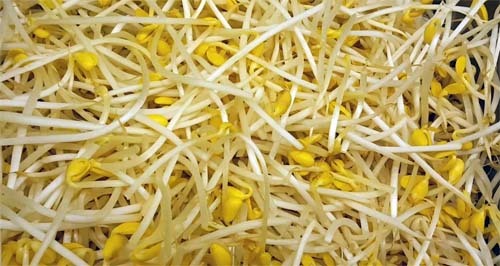 Mung bean sprouts are very perishable, so get them in the refrigerator as soon as you get home from the store. They have a very short life – maybe 3-5 days refrigerated. They add a nice crunch to any instant noodles. 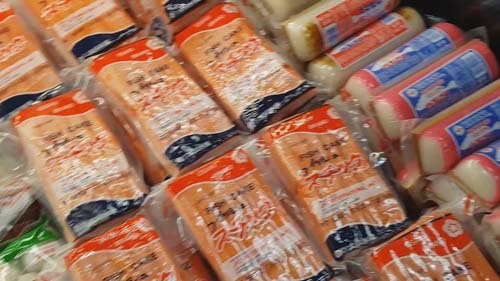 There are tons of different kinds of fish cake out there – kamaboko (looks like a little loaf on a piece of wood), narutomaki (a tube with a swirl pattern), and Busan fish cake (a fried South Korean delicacy). Fishcake usually is comprised of processed fish that is steamed or fried. Prep them by slicing thin and put a few pieces in a ziploc and put in the freezer. They tend to stick to eachother, so using multiple ziplocs works best. They’ll stay in good condition frozen for quite a long time. Of course, these work very well with seafood varieties, both Japanese and South Korea, and also in traditional Japanese varieties like shoyu and miso. They’re either refrigerated or frozen at the store. This leafy green is known either by cilantro or coriander. It adds a nice savory flavor to instant noodles when dropped on top as a garnish. 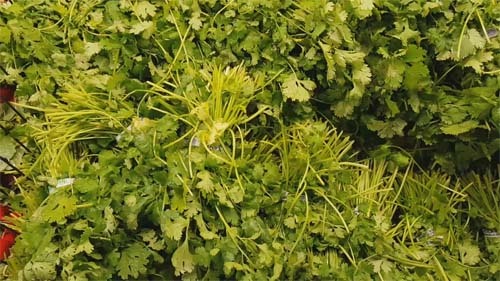 The trick with picking coriander is looking at the leaves. If they look saggy or wilted, skip ’em. If you see one lone bunch sitting where many should be, it’s probably going to go bad really quick as well. What I do is get a nice looking bunch and bring it home, give it a rinse under cold water, pat dry with paper towl and put in a loose plastic produce bag (grab an extra while shopping) in the crisper in our refrigerator. If your refrigerator runs a little on the cold side, they’ll go bad quicker, but since a bunch usually is under a dollar, just go and get more. Under perfect conditions, they should last 3-4 days. 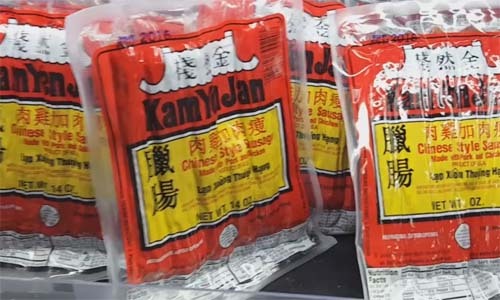 If you want to add beef or pork to your instant noodles and you’re on a budget, this is going to save you a ton of money. Go to where they have the packaged meats. Chances are you’ll find a ton of different cuts of pork and beef – and they’re sliced like bacon! 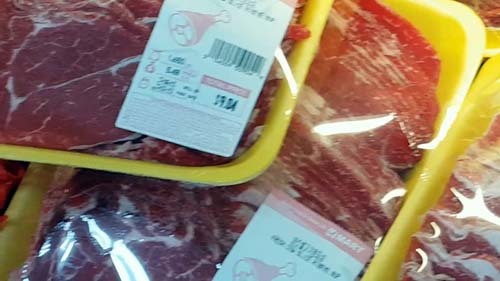 You can find beef sliced this way and get a few pounds for under $10USD . Get a big box of ziplocs and put about 3-4 slices in each one and then put them all in a big freezer ziploc. You can get about 20 portions out of it and all you need to do is either defrost and fry it in a pan or just drop in boiling water and let the fat also flavor your broth. 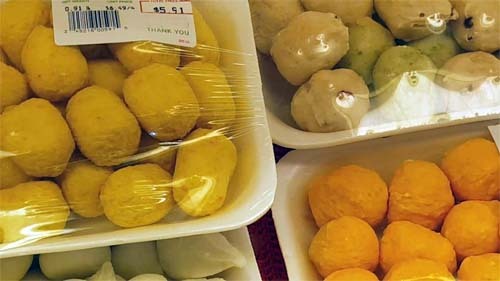 I first discovered Taiwanese fishball – these are hollow and sometimes have crab, or fish eggs inside. I have found I prefer the Malaysian or Singaporean varieties – Dodo brand is quite good. These are solid and come in an array of flavors like cuttlefish, lobster and prawn. These will be at the seafood counter or frozen in bags. Just boil them (for freshly made fishball, boil until they float). These work great in the freezer, but if they get a little freezer burn, they’ll get a little rubbery. I like fishball in seafood and curry varieties. 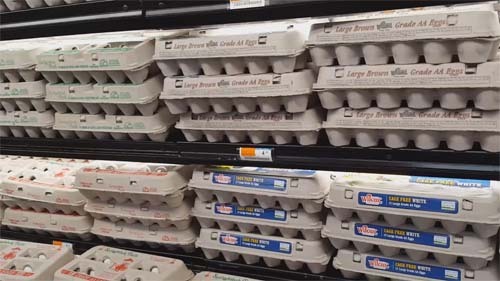 The thin shelled ovum of the domestic fowl can be found at most any grocery store. Fried on Mi Goreng, hard boiled with anything, stirred in with boiling broth, they work very well. I get asked ‘how do you get your eggs look that way’ when I make South Korean varieties sometimes. Well, it’s very common in Korea to simply drop a raw egg yolk ion a steaming hot bowl of ramyun. What I do is crack and egg into a ladle and rock it back and forth, letting the clear white of the egg spill out. There’s a little piece left which I’ll snip away. Drop on top of your noodles and stir it in. Eggs are relatively inexpensive and stay good for a long time. 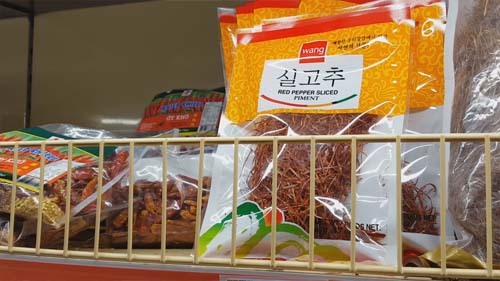 I have only found these once and they were in a large Korean supermarket with the dehydrated chillies and pepper powders. They’re extremely thin threads of chilli pepper that you can put on your instant noodles to give a neat little gourmet look. I found that they add a hint of spiciness to the broth. A bag of these will last forever since you only need to use a small amount. Stoe in a ziploc after opening and put in your cupboard. 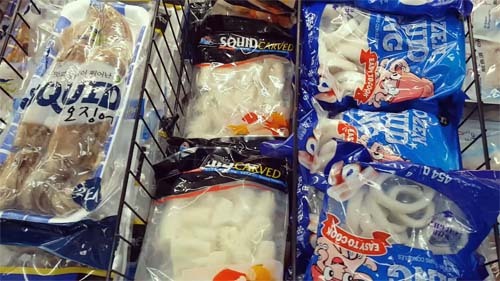 You can buy fresh squid, carve crosshatched slices in it, cut it in strips and boil, or you can just buy a nice bag of frozen carved squid! They’re great in seafood instant noodles and have a nice texture and flavor to them. These will stay fine in the freezer for months – put them in a freezer bag once opened. Got any favorite garnishes? Share them with me in a comment and they might make next years list!